The Hawaii Academy of Sciences (HAS) this week is putting out an early call to the state’s most innovative companies and organizations to help set the stage for the second annual STEM Week Hawaii. STEM Week Hawaii is a multi-day celebration of STEM (Science, Technology, Engineering & Math) education across the state, organized by HAS and supported by the Hawaii State Department of Land and Natural Resources (DLNR). The 2013 program will expand upon the first STEM Week Hawaii, held in April. Scheduled to run concurrently with the 56th Hawaii State Science & Engineering Fair (HSSEF), several special events will culminate in a gala awards dinner. These events include an Industry Exposition and Job Fair, which gives local businesses and organizations an opportunity to demonstrate their technology and services, and two fast-paced “Ignite STEM Week” presentations that will showcase some of the cutting-edge research and development taking place in Hawaii. Sen. Daniel K. Inouye was on hand to present the inaugural STEM Week Hawaii awards, which recognized STEM programs at 14 local schools. Mililani High and Highlands Intermediate schools took statewide honors, and Hawaiian Electric Company received the first Daniel K. Inouye Award for Commitment to STEM Education. STEM Week Hawaii is statewide program that recognizes schools that promote a rich variety of STEM activities, offer students many entry points for involvement in STEM education, conduct outreach to a broad and diverse population of students, or encourage co-curricular STEM programs that align with academic standards. Because of its unique, independent nature, diverse programs like VEX Robotics, FIRST Robotics, Science Olympiad, Cyber Patriot and many others are recognized in a single awards ceremony. 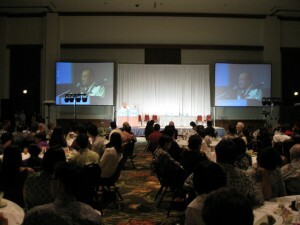 The core of the STEM Week Hawaii program, including the expo to the awards dinner, will take place April 7-9, 2013 at the Hawaii Convention Center. The science fair awards and STEM Week awards will both be announced on Tuesday, April 9. The locations and dates of the planned “Ignite STEM Week” sessions will be announced soon. All public and private middle and high schools throughout Hawaii are invited to participate in STEM Week Hawaii. (Elementary schools will be added to the mix in 2014.) And local companies are encouraged to support them, whether via the industry expo or through a range of sponsorship levels. For more information on attending, sponsoring, or presenting at STEM Week Hawaii, please visit STEMWeekHawaii.org.